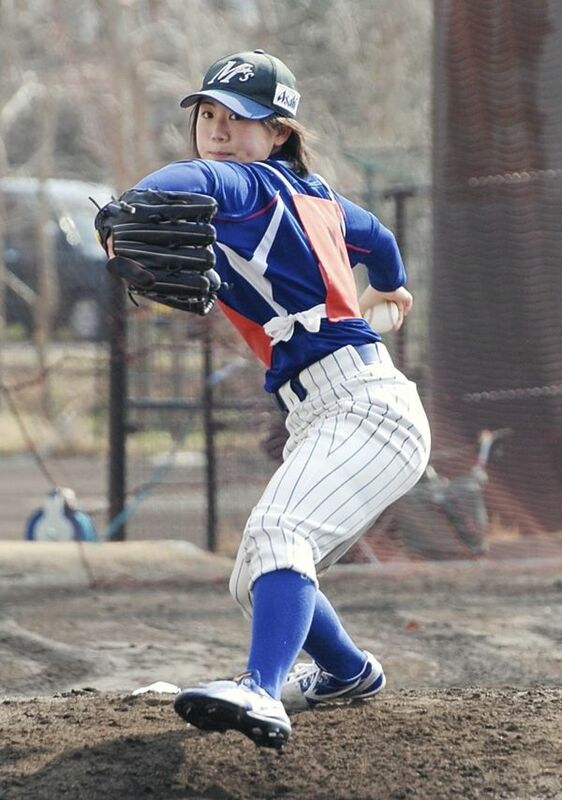 Eri Yoshida shows her development as a pitcher at a national team tryout in February. （The Yomiuri Shimbun, March 30, 2016）　Using the great equalizer that the knuckleball can be, Eri Yoshida has been able to mix it up with the men on the baseball field. Now the 24-year-old independent league hurler is making a pitch to take on her peers using a straightforward approach. Yoshida, who plays for the Ishikawa Million Stars of the men’s independent BC League, is bidding to make the women’s national team that will aim for a fifth straight title at the Women’s Baseball World Cup in September in Busan, South Korea. Yoshida was among the 24 players who passed a February tryout and remain candidates for selection. And she did it without relying on her trademark knuckleball — instead, she demonstrated her overall abilities as a pitcher. The tryout, held in Chiba Prefecture, tested the players in live-game situations. Yoshida faced nine batters and allowed three hits. While not a flawless performance, she threw her knuckleball only twice. She notably demonstrated a commanding mound presence in skills other than pitching — a pickoff move, covering bases, and communication with the infielders — which was a welcome surprise for the coaches. Since her debut in 2009 with the Kobe 9 Cruise in the now-defunct Kansai Independent League, Yoshida has been playing against men, which has been a key factor in her development. Yoshida’s movement on the mound was far superior to the other players, leading national team manager Koichi Okura to praise not only the quality of her pitches, but her overall performance. “Her moves on the mound were refined,” Okura said. Yoshida had tried out for the national team only once previously, when she was in her second year in high school, but was not selected.